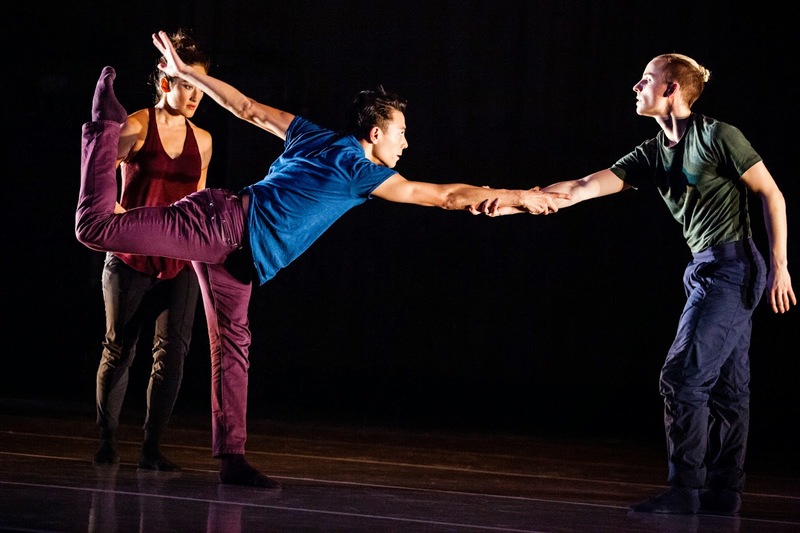 And Another Thing...: Whim W'him's "Threefold"
Whim W'him company members Jim Kent and Justin Reiter in Olivier Wevers' "We Are Not The Same"
That's what it was like on Saturday, January 17th. The kind of Seattle night where pools of water collect in every crevice and indentation on the roadways. The kind of night where passing cars kick up rooster tails that momentarily blind you on your way to a dance performance. In other words, it was the kind of post-holiday night when even the most die-hard Pacific Northwesterner harbors hidden dreams of Palm Springs' sunshine. But sun comes along in a myriad of forms. January 17th I found it at Whim W'him's "Threefold," a trio of new dances presented at the Cornish Playhouse at Seattle Center. I saw Whim W'him's inaugural performance exactly five years ago at On The Boards. Olivier Wevers' company has grown and evolved tremendously in that time. Wevers started with a pick-up troupe, mainly colleagues from Pacific Northwest Ballet augmented by other talented dancers from the Seattle community. Five years later, Whim W'him has seven company dancers, all technically proficient, all devoted to Whim W'him and, it appears from the performances, to one another. 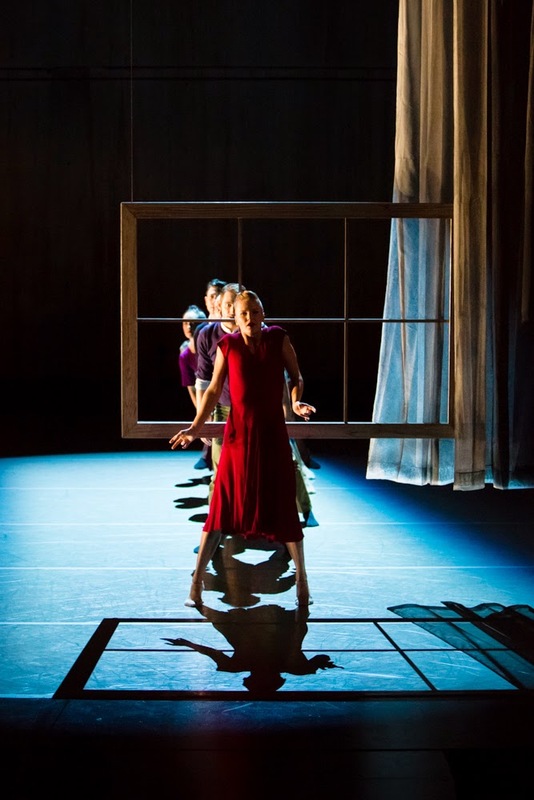 And, like the evolution of his company, Wevers' choreography has grown and become more sophisticated. Jim Kent and Justin Reiter in Wevers' "We Are Not The Same"
"Threefold" opened with Wevers' creation "We Are Not The Same." The dance is really a pair of interlocking duets, performed by (pair #1) Jim Kent and Justin Reiter, and (#2) Tory Peil and Kyle Johnson. The couples drift past one another, then engage, curling around their partners almost like koalas hugging gum trees. Then, wham, the connections break, and the duos uncouple, seemingly strangers to one another. Designer Michael Mazzola lights the bare stage with defined squares or circles of light. The dancers move into and out of those illuminated areas, the way romantic partners experience highs and lows in their relationships. 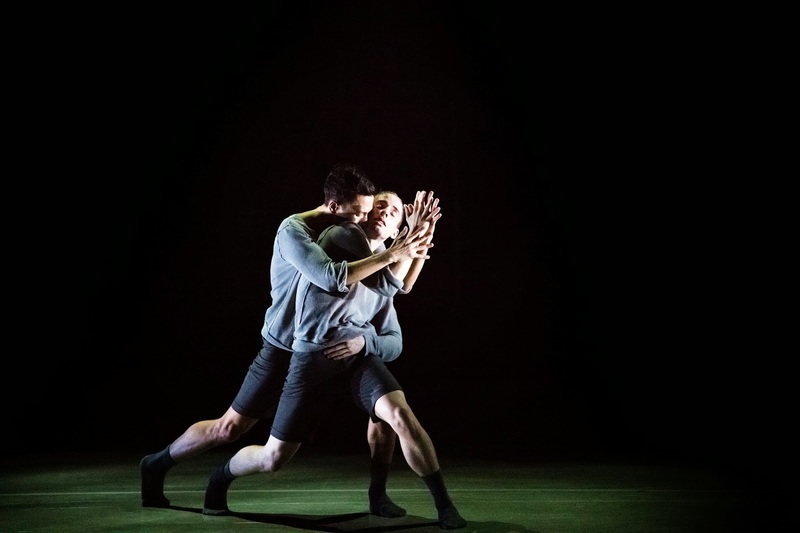 I've watched Olivier Wevers' make dances for almost a decade; his pas de deux have been his strength and with "We Are Not The Same," he extends that facility for intimate communication between two dancers into a more complex, thought-provoking work. Mia Monteabaro, Kent and Reiter in Loni Landon's "new year new you"
New York-based dancemaker Loni Landon's "new year new you" is a trio for Kent, Reiter and the powerful Mia Monteabaro. The program notes don't reveal much about Landon's intentions or inspirations. 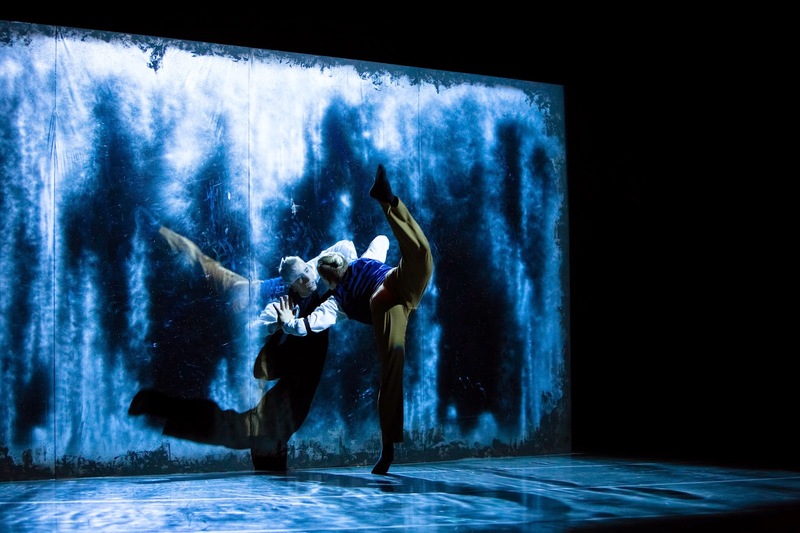 Dylan Ward's ambient sound design provides a landscape for the three dancers. The piece is most effective when the trio moves in unison, face to face or front to back. Landon uses the phrase "abstract meditation," and that's true up until the very end of the dance. The evening capper was Penny Saunder's lyrical and lovely "Soir Bleu," inspired by Edward Hopper's painting, with a new and wonderful score by Paul Moore augmented by additional instrumental music. Mia Monteabaro in Penny Saunders' "Soir Bleu"
Saunders' work is set on the full company. Tory Peil, Mia Monteabaro and the lovely Lara Seefeldt float and spin across the stage in gem-toned flowing dresses by costume designer Mark Zappone. The four men, Kent, Reiter, Johnson and Thomas Phelan, wear slacks, button down shirts and a variety of sweaters. A large mirrored wall lets Monteabaro and Reiter dance duets with themselves. Reiter cuts loose with an amazing series of movements. He can control each muscle in his body; a hand moves or a shoulder lifts, seemingly in isolation from Reiter's torso and limbs. I miss former Whimmer Andrew Bartee terribly, but Justin Reiter is a dancer to watch and to savor. Justin Reiter in Penny Saunders' "Soir Bleu"
"Soir Bleu" was balletic, it was melodic and it showed off the talents of all the company dancers. At one point, they line up single file behind a hanging window frame. The image of them executing a refined version of a sports stadium wave lingers in my mind. When the dance ended, I overheard a woman behind me say to her companion "I liked that one the best of all." I had to smile to myself. What "Soir Bleu" said to me is that Olivier Wevers has succeeded in assembling a company of artists as good as any in Seattle. And with "Threefold," he presented work to make you think, to inspire, and to delight on a dreary winter night. As I said, there's more than one kind of sunshine in Seattle in January. Whim W'him company members in "Soir Bleu"
HI Marcie, I think I was that woman behind you ;) I was sitting behind a woman taking notes. Very nice review that captured how I felt about the evening--rain, dance and all.